Soldiers Chapel in Big Sky, Montana is one of just two indoor ceremony sites in Big Sky where you can see Lone Peak down the aisle. Soldiers Chapel, located along the Gallatin River well down from Big Sky proper, doesn't seem like a place where you could get a view of the mountains, but the cut up the valley is just perfect to afford a spectacular view. One of the challenges of shooting a wedding inside Soldiers Chapel, though, is exposing for either the outdoors or the indoors. You can't get Lone Peak and the couple, it's either or. So imagine my excitement when Allison and Justin spent the majority of their ceremony standing off to the side while their preacher spoke in the middle. And then he started getting animated with his hands. I tried with all my might but was not able to also include the mountain in this shot, but I think this view will suffice! I am extremely happy with it as it's an unusual yet well executed ceremony shot, which is something very hard to do. Many things unfold during ceremonies, but rarely do they stand out or have good enough lighting to make a memorable image. But this one from Soldiers Chapel in Big Sky stands out as one of my favorites! 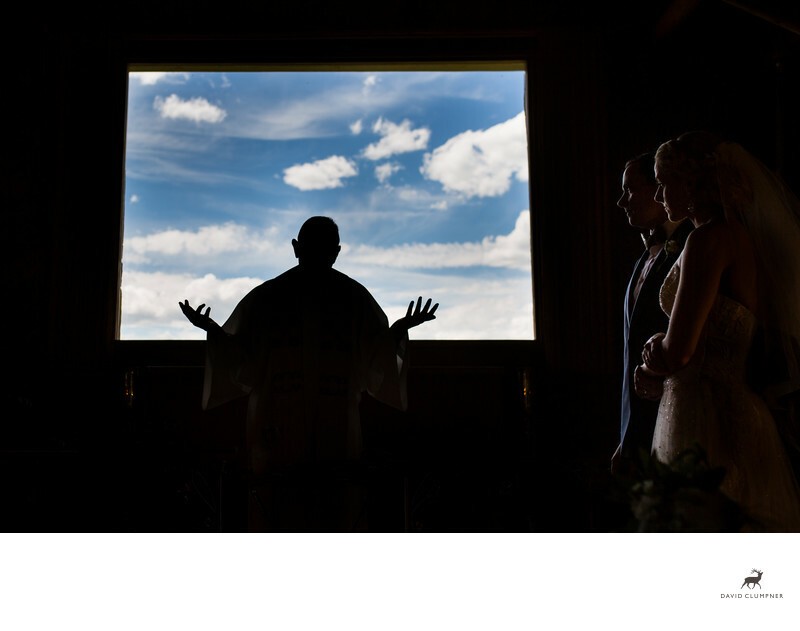 Keywords: big sky wedding photographers (12), big sky wedding photography (12), bozeman wedding photographer (3), Montana Wedding Photographers (72), Montana Wedding Photography (81).